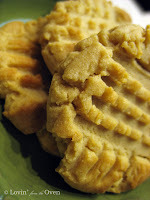 Frieda Loves Bread: Peanut Butter Cookies: Got Dunkability? 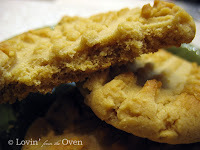 1 Peanut Butter Cookies: Got Dunkability? My husband informed me that his office is having a baked goods party....and he wanted to bake something. Something to do with celebrating Valentines Day. Can I bake some sugar cookies? To me, nothing says Valentine's like sugar cookies. Uh...No, I'm not a big fan of sugar cookies. I did not know that. I have been married to this man for almost 21 years and did not know that. I want to bake something else...err...maybe peanut butter cookies? Okay, I'll make some for you. Remember, I'm the one that likes to bake! Okaaayy...this was like me wanting to make a birdhouse using his shop and tools...I wouldn't know the first thing about using a table saw. I showed him which recipe that our family likes out of the 10 or so peanut butter cookie recipes that I have collected over the years. Our family likes this one for one reason only. These cookies are crisp on the outside, chewy and tender in the inside and have dunkability. That is, the ability to be dunked in a glass of milk without totally falling apart. I am NOT a dunker. But, being in a family of boys, they just HAVE to dunk their cookies in milk and drink the cookie mush from the bottom. After 20 minutes, my husband comes out. Hypothetically, if I were to forget to turn the timer on, how would I know when the cookies are done? He shrugged his shoulders. Don't know. Ten minutes? I race out to the kitchen and take a peek. The cookies are just turning a dark brown around the edges. It's really hard to tell with a brown cookie...but they were ready to come out. He grabbed a spatula and lifted a cookie onto the cooling rack. It crumbled before he could set it down. Wait! I said. You gotta let these cookies cool on the baking sheet to help them set up. Dunkability, remember? This recipe comes from my good friend, Janet. It works every time. Add eggs, peanut butter and vanilla. Mix in flour, salt and baking soda. Mold into balls the size of walnuts or use a 2 T. cookie scoop onto ungreased cookie sheet. Press each cookie with the tines of a fork, dipping the fork into flour if necessary. Frieda, I love your writing style along with the great recipes! It's very chatty and humorous, which is to me the best kind of food writing! The recipe sounds great! I have one that has major dunkability as well--it's very simple too and we all love it--it's basically a cup of PB, a cup of brown sugar, 1 lg egg, 1tsp baking soda and 1/2 to 1 cup chocolate chips. Mix together, make into balls that you flatten in the usual way with a fork on non-stick cookie sheets or parchment paper and bake at 350 for 9 minutes. Let stand for 5 minutes and then take off the sheets to eat or store! Yum!